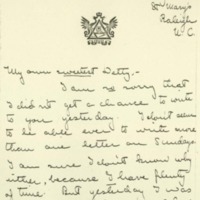 Eleanor Wilson McAdoo writes Jessie Wilson Sayre with news from St. Mary's School, in Raleigh, NC. I am so sorry that I didn't get a chance to write to you yesterday. I don't seem to be able ever to write more than one letter on Sundays. I am sure I don't know why either, because I have plenty of time. But yesterday I was feeling sort of bum and headachey and so I lay down on the bed and before I knew it it was time to get ready for afternoon chapel. You don't know how overjoyed I was to get your dear letter. Oh, Detty! how much I love your letters and how they cheer me up and make me happier! But oh, they make me long so much to see you my own sister. I love you so muchWe have been having a very distressing time here. One of the teachers, Miss Spurlock, died on Friday night, and it was especially pitiful since her only relative, a sister didn't get here oin time. We have all felt dreadfully about it, as we all liked her so much. McAdoo, Eleanor Wilson, 1889-1967, “Eleanor Randolph Wilson McAdoo to Jessie Woodrow Wilson Sayre,” 1907 February 25, WWP17375, Jessie Wilson Sayre Correspondence, Woodrow Wilson Presidential Library & Museum, Staunton, Virginia.